Rollover Bingo offers a generous deposit match promotion. New players are eligible for a doubling of their first deposit up to the value of £150. The minimum deposit requirement is £20. Thereafter every subsequent deposit is matched by a further 50% totally free. It’s like getting 50p in free tickets for every £1 in funds added to the player’s account. Rollover Bingo is a Cashcade Ltd. web site, registered under the laws of England and Wales with offices in London. Its Bingo Room uses 888-software licensed in Gibraltar, with English used as the primary language and the British Pound Sterling as the basic currency. No download is required in order to play. What sets Rollover Bingo apart from its competitors is a novel way of rewarded its customers with National Lottery lines and the opportunity to win huge while risking as little as a few pennies. The bread and butter of Rollover Bingo is its traditional U.K. classic 90-ball Bingo in most rooms, complemented by the U.S.-style 75-ball Bingo format in others. There are guaranteed 90-ball jackpots of £100 to £300 offered every evening at 9pm GMT. Cards can be pre-purchased for these. Meanwhile, a Rollover Jackpot is offered in the 75 ball room. If nobody bingos on the Lucky Star pattern within 46 calls, a small amount is set aside for a separate jackpot that rolls over until some a winner catches bingo in 46 calls to claim the prize pool. Also, some of the Bingo rooms are designated as 1tg or 2tg. That means additional prizes can be won inside on cards missing out on the initial Bingo with 1-to-go or 2-to-go. In conjunction with the basic Bingo games, Rollover Bingo has plenty of Chat Games. There are also Bingo Tournaments offered, and Instant Win games are available, too. The latter includes slots, keno, blackjack, and roulette, all of which can be easily accessed from the Bingo lobby after sign in. 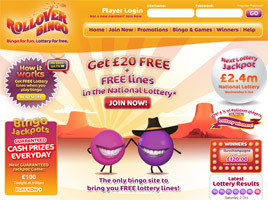 Rollover Bingo is the world’s only Bingo site that offers free lottery lines to its players. The process begins as soon as a new player joins and deposits £20 or more. A free syndicated National Lottery line is then awarded for every £5 spent on bingo cards, with a cap of 30 lines per player per day. Players should note that only Bingo spending counts toward the £5 requirement—wagers on instant win games, slots, and video poker are excluded. Other terms and conditions also apply. The more Bingo one plays, the more free lottery lines are awarded every 24 hours. Lotto draws are conducted on either a Wednesday or Saturday each week. Any play on the day of a draw will be credited to the next draw. Each line awarded is part of a syndicate of 49 players. Should the line qualify as a winner with a 5- ball match or above, the winnings will be shared among the 49 players. Statistics show that syndicates win the National Lottery about once every four jackpots, so it is a great way to increase one’s chances of getting lucky. Should the syndicate muster only a 3- or 4-ball win, Rollover Bingo pays out the full amount of winnings to each player in bingo points (BPs). Literally millions of BPs are given away every month, and they can later be exchanged for bingo cards. Bingo pints can also be earned through play at a rate of one BP per 10p in card purchases, or two BP for 25p worth of purchases, and so on up to a full ten BPs per £1. Points can also be obtained from Chat Hosts, who are armed with tonnes of BPs to give away to the winners of chat room games. One other way to get BPs is by referring friends to Rollover Bingo. For each one who signs up and begins play, a whopping 5,000 BPs are awarded on the house. Referrals can easily be made by using the site’s “Refer a Friend” tab; simply fill in the friend’s details and the site will issue the invitation. To qualify, referrals must be at least 18 years of age and resident in the U.K.